On Tuesday 7 February 2017, SANEC welcomed the trade delegation from the Western Cape, South Africa. 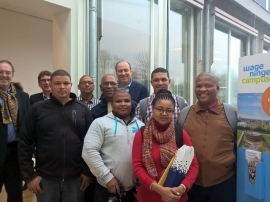 The delegation comprised of 5 farmers from the Western Cape who came to the Netherlands on a market research study accompanied by the Western Cape Government: Department of Agriculture. The Western Cape Department of Agriculture in South Africa does this on a yearly basis as part of a capacity building initiative targeted at smallholder/emerging fruit farmers. SANEC and its member Rabobank International, hosted the delegation through an afternoon business seminar, whereby our members had the opportunity to meet the delegation and create potential partnerships and build on future business opportunities through a matchmaking session. We would like to thank all our participants for joining the business seminar and we would like to give a special thanks to our member Rabobank for hosting us in Barendrecht. SANEC also organised a field visit to retail store Albert Hein for the Western Cape deletation and farmers on Wednesday the 8th of February. It provided them with more insight on retail business regarding fruits and vegetables in the Netherlands. This was followed by a visit to the well renowned Dutch institution, Wageningen University and Research Centre, known for its top knowledge on agriculture. For a photographic impression of the event, please have a look on our Facebook page here and give us a like.